To mark Guarino Guarini’s birthday today, this post aims to correct a fundamental misconception about the architect: his name. Many reference works – from Wikipedia in most languages, to even the Encyclopaedia Britannica or authoritative library catalogues – refer to him as “Camillo Guarino Guarini,” sometimes suggesting that he was baptized “Camillo” and took the name “Guarino” upon entering the Theatine order as a novice at age 15 in 1639. Battezzati di S.a Margheria. 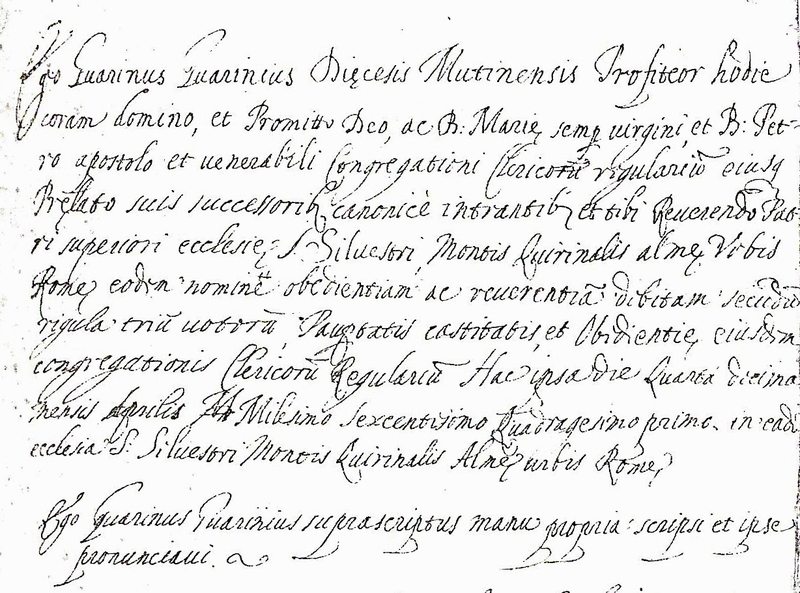 Addì 22 Gennaio 1624 – Guarino, figlio del S.r Rinaldo Guarini et della Signora Eugenia Marescotti sua moglie fu battezzato. Furono padrini il Signor Marcello Guerenghi et la Signora Seghizza sua moglie. Fortunately, some important reference works have resisted the popular proliferation of “Camillo Guarini” – the Getty’s Union List of Artist Names (ULAN) and the Dizionario Biografico degli Italiani (DBI), to name two. Even German Wikipedia has it right. Tracing the source of the mysterious mistaken name “Camillo” requires lengthy research going back to late seventeenth-century Paris (Klaiber 1999, pp. 220, 235 n. 4, and Klaiber 2001, p. 31, cited below). There, in the wake of controversy surrounding the Theatine church Sainte-Anne-la-Royale, the name of the Theatine superior in Paris, Camillo Sanseverino, became conflated with the name of the church’s architect, Guarino Guarini. Indeed, the fictive name “Camillo Guarini” appears exclusively in French sources throughout the eighteenth century. Only in the early nineteenth century does it begin to spread to English, German, and other texts. The mistake became firmly entrenched in reference works when it was included in the Thieme-Becker Künstlerlexikon entry on Guarini in 1922. No one is exempt from such errors. In his recent piece “One of Science’s Most Famous Quotes is False,” New Yorker staff writer Michael Specter confessed that for years he had unknowingly propagated an invented quote long attributed to former Surgeon General William Stewart. So even the legendary fact-checking department at the New Yorker also slips up sometimes. My own confession is this: when writing my dissertation, I failed to double-check all of the details, choosing instead to rely on my memory for material I thought I knew well. For the most part, this worked out just fine, but one error did sneak in – I gave the name of Guarini’s father as “Raimondo” rather than “Rinaldo.” This was a small and fairly insignificant mistake, but I then repeated it in my 1999 article on Guarini listed below, checking the detail in my dissertation rather than the primary sources. Years later I was horrified to discover that the error was picked up in the Dizionario Biografico degli Italiani entry on Guarini, cited above. False information gets introduced into even authoritative reference works so easily and inadvertently. The historian’s only recourse is constant vigilance and active critical thinking. Did I really read it that way? Does that make sense? Why do they all call him “Camillo”? References to Wikipedia correct as of date of posting. Tommaso Sandonnini, “Il Padre Guarino Guarini modenese,” Atti e memorie delle RR. Deputazioni di storia patria per le provincie modenesi e parmensi, series III, volume V, part II (1890): 483-534. Susan Klaiber, Guarino Guarini’s Theatine Architecture, Ph.D. dissertation (Columbia University, 1993). Susan Klaiber, “Guarino Guarini, Honestis Parentibus Mutinensis,” in M. Bulgarelli, C. Conforti, G. Curcio, eds., Modena 1598. L’invenzione di una capitale (Milan: Electa, 1999): 219-237. Susan Klaiber, “Guarini e Parigi: interscambi culturali e critici,” in G. Dardanello, editor, Sperimentare l’architettura. Guarini, Juvarra, Alfieri, Borra e Vittone (Turin: Fondazione CRT, 2001): 15-36. This entry was posted in Miscellaneous and tagged 17th century, Architectural history, Architecture, Art history, Baroque, Baroque architecture, Fact checking, Guarino Guarini, Historiography, History, Modena, Paris, Rome, Wikipedia by Susan Klaiber. Bookmark the permalink.